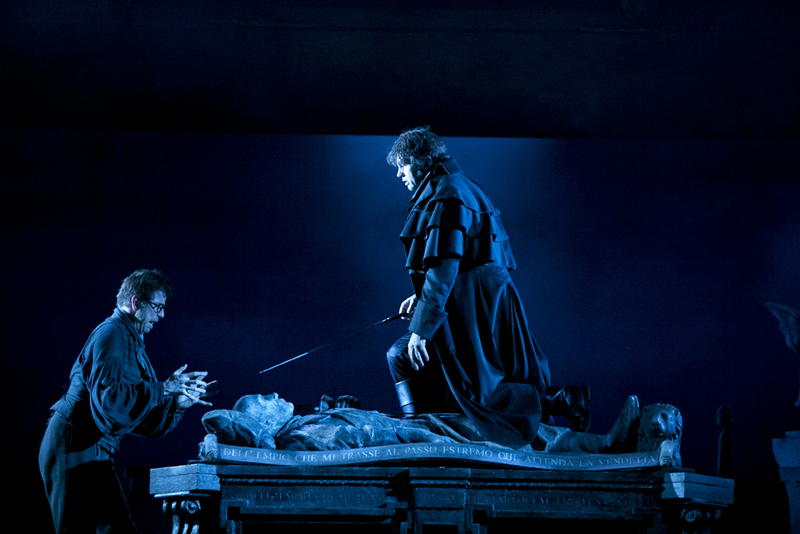 A world-class staging for Don Giovanni as the first instalment bodes well for the continuation of Sir David McVicar’s Mozart Trilogy for Opera Australia. Rhodes pretty much owns Sydney at the moment thanks to a flotilla of Don Giovanni and The King and I flags all over town. 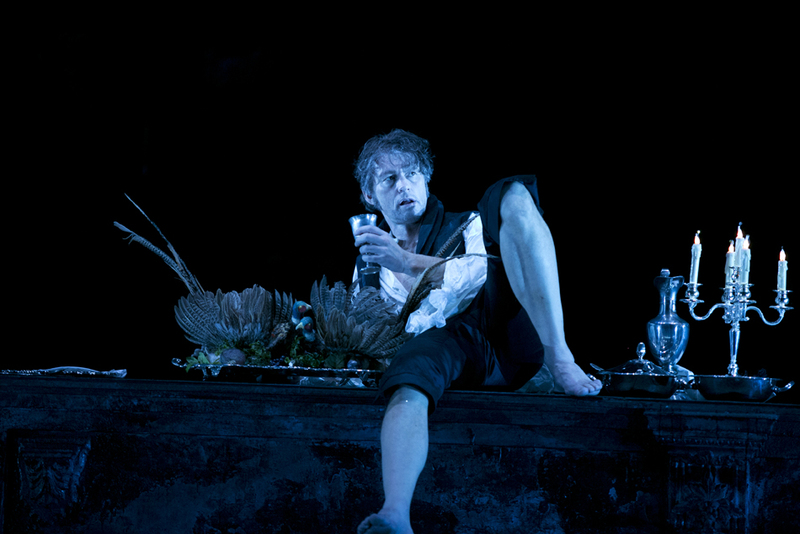 In virile thick wavy wig and smart black finery, Rhodes cuts a dashing figure as the loathsome, lusty lothario. Rhodes’ mastery of the score puts the audience totally at ease, and, with high-class castmates to work with, Rhodes is in top form. In strong voice throughout, it’s the cheekily malevolent twinkle Rhodes uses to accompany the Don’s misdeeds that really makes the role his own. Aided by terrific design, McVicar keeps the storytelling clear and the action brisk and enthralling. The lead characters are distinct and sharply drawn. An even more impressive achievement is the direction of the ensemble, where each and every performer has a unique character to play in each scene. Ensemble quality is aided in this regard by the presence of 12 actors, yet credit must still go to McVicar for such exemplary, detailed work. Having the men standing around at court in the current Rigoletto looks sadly amateurish in comparison. Clever business aside, McVicar allows the popular arias of the score to be sung, and enjoyed, without interference. Robert Jones’ glossy black design is nothing short of brilliant, making the Sydney Opera House stage seems about four times bigger than usual. Just when you think all possible set pieces have flown or glided in, there is yet another change of state. Stairs, columns, walls, windows and archways in intricate marble designs all match and fit perfectly. This visual splendour, coupled with the singers’ artistry, means that the 200 minute running time fairly flies by. Jones’ gray and black palette continues with the costumes. This creates a striking overall effect, yet robs the staging of touches such as signature colours for the three wronged women. 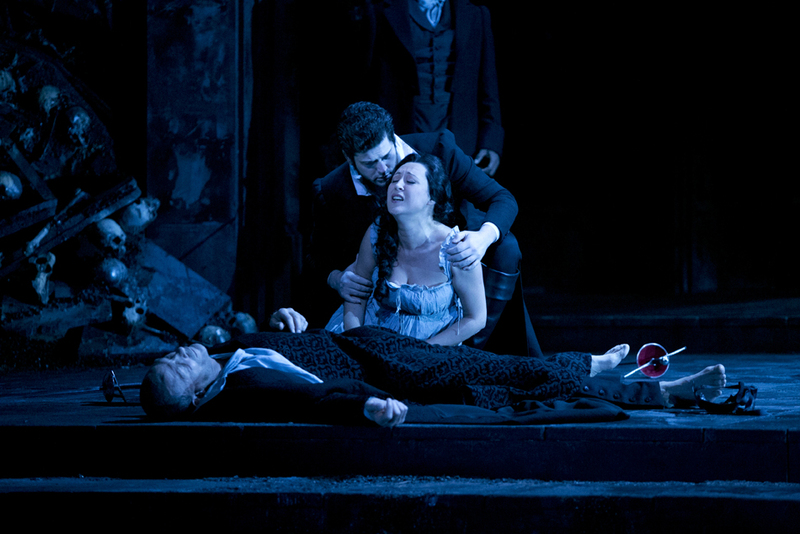 The impact of Donna Anna’s black mourning dress is completely lost. In an interesting, and successful, choice for a period piece, Jones has the principal performers’ hair and makeup looking natural, almost to the point of using present day styling. Lighting designer David Finn makes a massive contribution to the stage picture, expertly placing lights so that overhead slats makes textured splays of light across the set. The overall feel is dim and moody, yet faces are clear throughout. Finn is also a master of the slow reveal, bringing lights up incrementally to allow eyes to gradually make out details of the images. Conductor Jonathan Darlington’s pristine work results in an immaculate performance of the classic score by the Australian Opera and Ballet Orchestra. The music sounds superb in its own right, yet never comes close to overshadowing the singing in any way. Rather than a comically short and stocky Leporello, McVicar has cast imposing bass Shane Lowrencev, who is a close physical match to Rhodes. This not only makes the identity confusion of swapping outfits make sense but creates an interesting comment on the class system at play when Don Giovanni is able to railroad Zerlina’s wedding feats yet his servant Leporello is instantly vilified for the same behavior. The quality of Lowrencev’s rich bass also makes him a strong performance partner for the mellifluous vocals of Rhodes. Elvira Fatykhova is in lovely voice as Donna Anna, demonstrating again the immaculate control she has over her fine soprano even at any body position. Luminous soprano Nicole Car captures the eternal longing of Donna Elvira, the characteristic lustre of her voice a fine asset to her performance. “Mi tradi quell’alma ingrate” is a tender, affecting act two highlight. Taryn Fiebig conveys the playful, trusting nature of the capricious Zerlina, singing the role with requisite sweetness. In the frequently overlooked role of Anna’s betrothed Don Ottavio, tenor John Longmuir is an absolute revelation. His gorgeous tenor voice ringing out with sterling clarity, Longmuir has a centred, impassioned focus that commands attention. 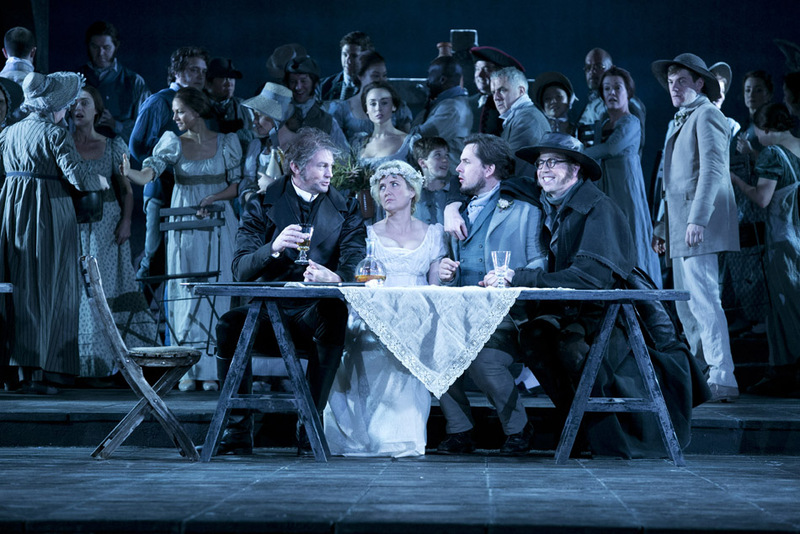 In a performance filled with excellent vocals from all singers, Longmuir provides two clear vocal highlights: “Dalla sua pace la mia depende” in act one and “Il mio tesoro” from act two. 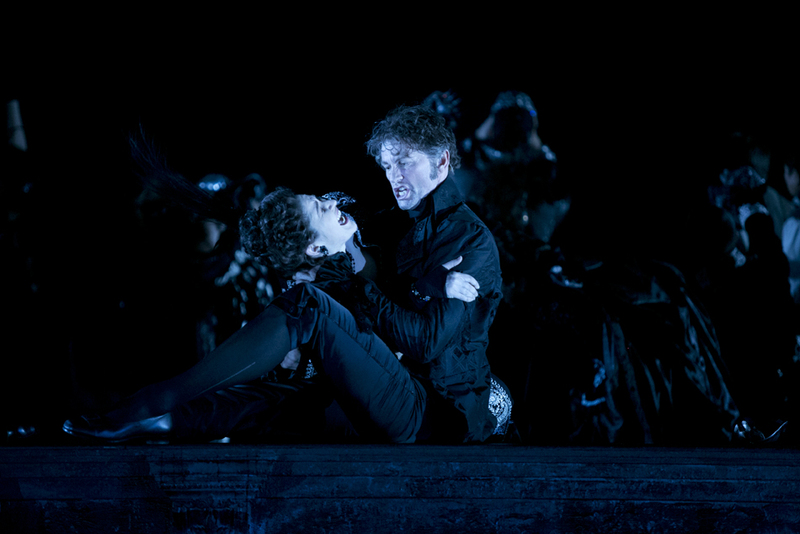 A strong conclusion to an outstanding Winter season, Don Giovanni is highly recommended.